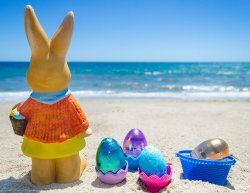 The warm clean, waters of the Outer Banks draw many families to our shores on a seasonal basis--even families of different species! 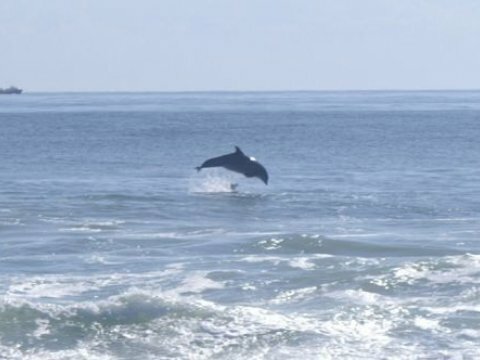 How many of us during our time on the Outer Banks have watched with joy and fascination the antics of the bottle-nose dolphins along our beaches? How many of us treasure these special moments and wonder, "I saw dolphins here last summer, I wonder if these are the same ones?" Surprisingly, the answer is "Yes, they probably are the same ones." 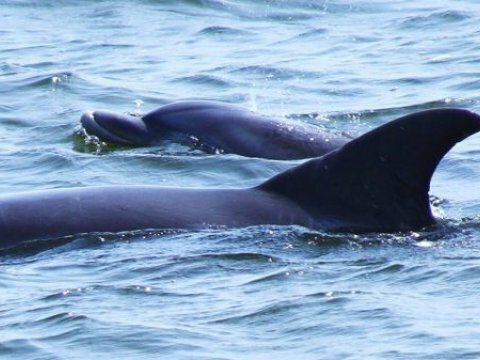 The families of dolphins on the Outer Banks return to the same area year after year to bear and raise their young. 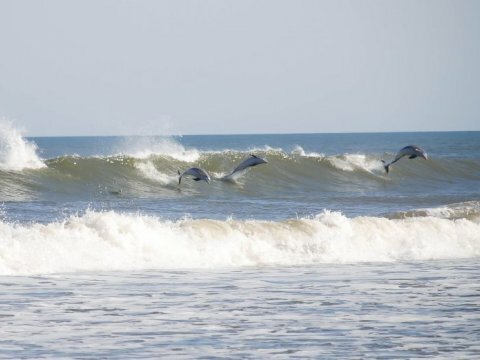 It is estimated that over 500 dolphins call the Outer Banks home during the summer months. The summer dolphins arrive in early to mid-May to give birth to their young. They remain throughout the summer and then migrate south for the winter. But the Outer Banks is also their winter home. 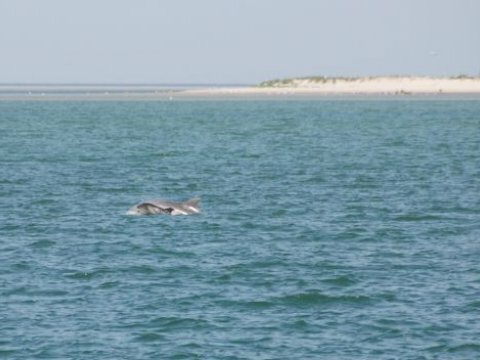 It was recently discovered that our summer dolphins, along with all of the bottle-nose dolphins who summer north of her all the way to New Jersey, spend their winter between Cape Hatteras and Cape Lookout. You can even identify individual dolphins, if you look closely. The Nags Head area is the summer home to one of the most important dolphins on the East Coast. "Onion" is his name. Onion was first identified in Beaufort, NC almost twenty years ago! He has been sighted there almost every winter since. 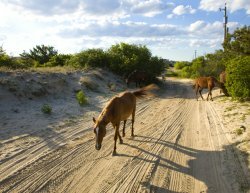 It has been discovered that Nags Head is his summer home, along with an extensive family of more than 100 members. In his early years, Onion had an unfortunate encounter with a boat propeller and his damaged fin has made him one of the most easily recognizable dolphins around. 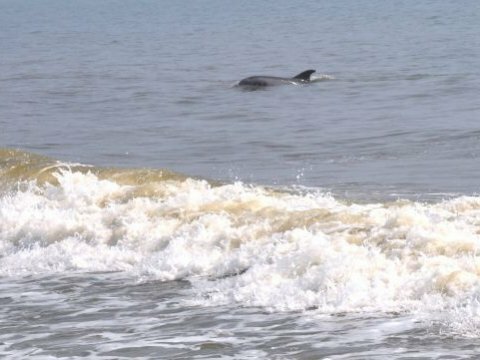 Although Nags Head is his family's summer home, Onion and his companion, Pinchers, tend to wander a bit, visiting other dolphin groups along the beach. 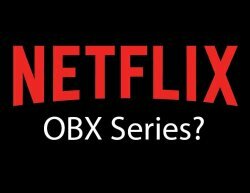 So keep your eyes open and binoculars up and you might catch a glimpse of Onion just about anywhere on the Outer Banks. 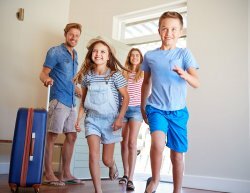 The Outer Banks is a special place to many families. While enjoying it with your family, keep an eye out for some of our other families who make this such a special place. And, should you encounter a dead or stranded whale, dolphin or seal, call the North Carolina Marine Mammal Stranding Network at 252.728.8762.